Junk Mail now offers our private users the option to register an account. Having an account has fantastic benefits for all private users that want to make their online and mobile buying and selling a breeze. 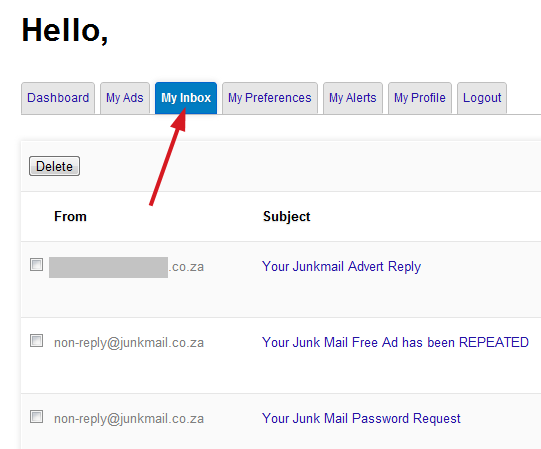 You can register by clicking the “Register” link provided on our home page www.junkmail.co.za. You will be directed to an easy-to-complete registration form. Simply complete it and click on “Get Registered”. You will then be sent an email to activate your account. Click on the verification link within that email and you are ready to use your new account. Alternatively, click here to register your Junk Mail account. What is the difference between “Private” and “Trade”? Ticking the “Private” box on the registration form indicates that you are an individual seller representing yourself. Ticking the “Trade” box, on the other hand, indicates that you will be advertising on behalf of a business. Private sellers have a lot more freedom in placing their ads. Traders have more rules than private sellers, but they also have more features, like the trader directory and trader sites. By indicating whether you are a private seller or trader, we know what rules and features apply. 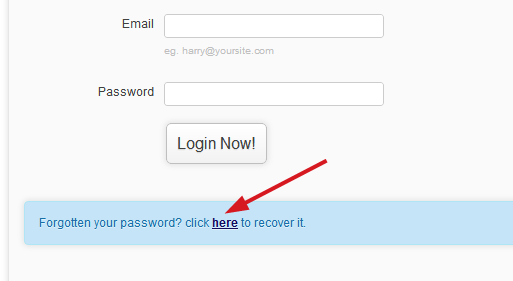 On the home page there is a “Login” link that will take you to the login page where you will be required to enter your chosen username and password. If you aren’t able to login, verify your credentials and make sure that you have verified your account. Alternatively, click here to login to your account. Where can I view my advert responses and messages? In this day and age, it is practically impossible not to have an email account of some kind. However, it is also quite easy to see your email account become flooded with responses from your Junk Mail ads, making it difficult to manage all the other things you need to do. The Inbox feature of your user account acts just like your email inbox, except that it is clearly dedicated to your Junk Mail ads. All emails are saved to your inbox and sent to your email by default, but if you wish to manage everything online, you can select “Don’t email me. Manage all ads online” in the “My Preferences” tab. Security is a major concern online. As part of our new user account, we make it easy to ensure that any ad that is placed using your telephone and email address will be placed by you. Once your create your account, you can “Lock my email address” and “Lock my telephone number” in the “My Preferences” tab. When you do this, you won’t be able to place an ad without logging in. On the other hand, no one else will be able to place an ad with your email address or telephone number. You can set up alerts to receive ads placed for items that interest in your email inbox. Once logged in, click on the “My Alerts” tab. 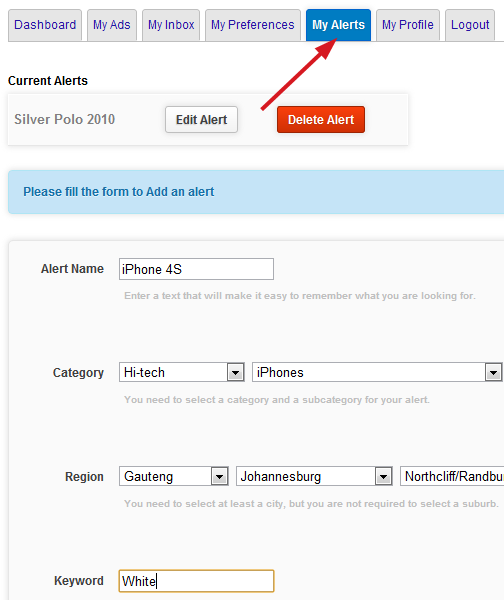 Here you will find a form to set up an alert for specific items/services. When you’ve completed the form, click on “Save”. You must select at least to the city level in the Region select. It is also strongly recommended to set a keyword. How do I edit or delete an alert? When you click on “My Alerts” in your account, a list will be displayed of all your current alerts. Here you will be able to edit or delete these alerts, or set up entirely new alerts. You are also able to view, edit or delete your alerts from you Dashboard. Why cant I get into my Junkmail account? I have tried to register again but I get the message email adress already exists. I have tried to reset my pasword but no luck….please help! One of our Customer Care Consultants will be in contact shortly. Alternatively, please email us at CustomerCare@JunkMail.co.za. Please email us at customercare@junkmail.co.za with your details and one of our Customer Care Consultants will assist you.